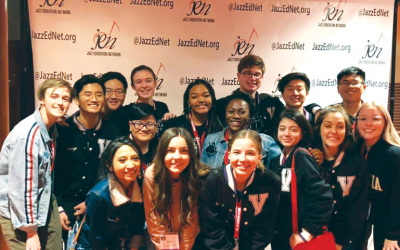 Valencia High School’s “Two N’ Four” Vocal Jazz Ensemble has just returned from the “Jazz Education Network” National Jazz Conference in Nevada as the only high school selected to showcase in America what’s good in jazz education. 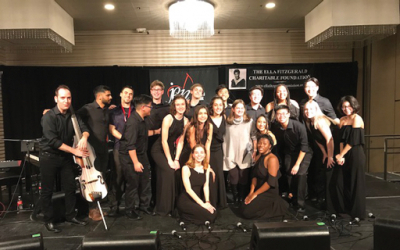 They performed to a packed ballroom of 600 University and high school Educators, Musicians, and Curriculum Writers from Juiluiard, UNT, Berklee School of Music, Western Michigan, University of Miami Frost Conservatory School of Music, etc. This was a music education highlight honor for Valencia High School, and one of immense importance for our students as it has the potential for full scholarships to college! The students were also showcased in an educational presentation with Darmon Meader, member of New York Voices and a panel of educators from Frost Miami Conservatory School of Music and University of North Texas. Please congratulate the following students on their 50-minute showcase of 10 songs at the Nation JEN Conference! These students who worked through winter break represented our school incredibly well! Alexia Vincent, Danna Dumandan, Samantha Anderson, George (Yesong Kim), Stephen Yang, Eugene Tuzon, Kenneth Borchart, Elias Clay Riche, Youngjin Kim, Zachary Miranda, Madisyn Miller, Kelley Fredrickson, Sophia Bellefeuille, Jaden Lewis, Denise Nunez and Amber Griffith.